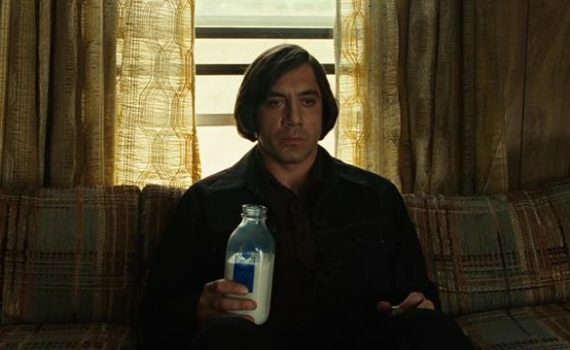 It took me ten years to really appreciate No Country for Old Men; that’s a shockingly long time for a Coen Bros. movie. They are living legends, their films are masterpieces, they create some of the most original content and adaptations in Hollywood; when one of their movies is released it should be a spontaneous national holiday. But even magicians can miscast a spell sometimes, and the Coens are no exception. There have been a few clunkers along the way, and when I first saw No Country, I thought I had just experienced one. It was like Fargo but without the kooky, killer humor, a depressing march toward death without the relief of comedy. But now that I’ve watched it again, I can appreciate the mood that’s developed in layers from the very beginning, from the first lines to the last scene, and I didn’t mind not laughing. Murder in the Texas back country; a dismal affair without a clear winner. Local hunter Llewelyn Moss stumbles upon a drug deal gone wrong, with dead bodies strewn about and bloody trails leading off into the distant. Moss follows along and discovers 2 million dollars left in a satchel, the result of no one being alive to claim the money. He takes it, hides it, and prepares, because he knows that powerful people will be around to look for the cash before too long. But he doesn’t count on the ruthless talent of Anton Chigurh, an assassin who is completely out of his mind. Moss runs, Chigurh follows, and a sheriff named Bell tries to figure out what the hell is going on, before everyone winds up stiff & cold. I do still prefer quirky Coen, funny Coen, weirdly original Coen. This take on a Cormac McCarthy novel is darker than usual, or at least it doesn’t have the breaks for breaths that are typical of the Coen Bros. That’s what threw me at first, when I saw it as it came out, that it was so stark and sad without any relief. But this time around, I think I began to understand what was happening. It’s like audiences are in a grave, and each scene is a shovelful of dirt that slowly covers us over time, the pressure building until we want to scream. I appreciated that sense of dread this time around, that despair when there’s nothing you can do to stop something dreadful from happening. The directing was great, obviously, and the cast was something special: Brolin, Bardem, Jones, Woody Harrelson, Kelly Macdonald, Garret Dillahunt, Barry Corbin, Stephen Root, and even Caleb Landry Jones in a tiny role at the end, but where you can definitely see a kid and you go “hey I know him!” I’m glad I sat down to experience No Country again, because it’s a complicated, nuanced, slow-building film that deserves the time and effort it takes to like it.